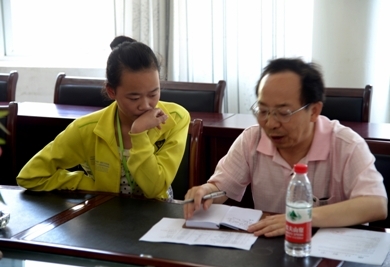 On June 3, 2013, Mr. Xi, a business owner and volunteer, drove Mr. Hu Jining and I to Gang Kou middle school and Gang Kou Elementary School to interview and visit some of the poor students. Since it is Monday, we can only use lunch time and after school time to visit families. Between classes, I interviewed some of the students at school. Four UW-Madison students volunteer to teach English and culture for 10 days at this school and they have done a wonderful job (I observed one). They visited three poor students family with us and gave the students some nice gifts. Overall, 12 UW-students plus one local college students volunteer in 3 middle schools. Wu Ming, also named Chen Ming, was born in October 1999 and is in 7th grade in 2012-13. She is an active and lovely girl despite complicated family situation. She likes singing and Chinese but finds math hard. She is friendly with quite a few friends in school. Her own father died (suicide) when she was 2. Her mom remarried and her stepfather treated her well. Her mom is a little retarded. She currently lives with her grandma (her stepfather's mom), her stepfather, her mom, and her stepfather's tiwn brother. Her uncle was injured in a motocyle accident and still has some health issues. The accident caused the family more than 10000 yuan in medical bill. Both her stepfather and his twin brother do odd jobs to support the family. The family look poor. Lu Qinmeng (right-front), a 8th grader born in August 1999. She is very good at English and Chinese. She lives with her grandparents and her father. Her moth left her when she was 1. Her father was seriously injured in a car accident in 2006 and has had retarded ever since. Her father now works as a cleaning staff at a local company. The back row are Mr. Hu and four volunteer undergraduates from UW-Madison (teaching at her middle school for 10 days). The front row include her grandparents and me. She has been sponsored by Victor Chan and Daisy Jiang. 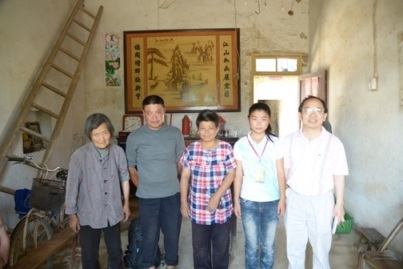 Guo Lvqin （2nd on right from the door) is a 9thth grader born in 1997. She haa a lot of pressure in school as the high school entrance exam is very close. She is very good at Chemstry while not so good at Physics. She is 2nd in her class. She also likes badminton and dance. She lives with her often sick grandparents and her parents. Her parents look handsome and beautiful respectively but neither can speak or hear. Still they are doing odd jobs to support the family. The house looks well maintained. She has been sponsored by Mr. Luoying Weng. Shijie Yan is a 7th grader bron in December 1999. As you can see, he is a lovely boy and enjoys talking. He lives with grandma, parents, and sister in 12th grade. His father was discovered to have `white blood' disease 4 years ago and has to be treated regularly in Wu Hu (2 hour drive away). He lives English and is good at it. He has been sponsored by Eric Fang family. 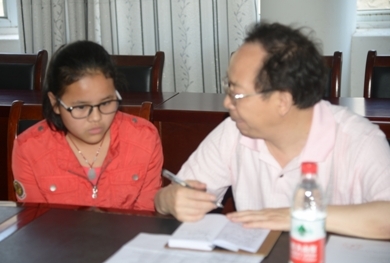 Meng Wang is a 7th grader born in 1999. She lives with her parents and a 5 year old sister. Her mother has lung disease and stays at home. Her father works at a local Chemstry factory to support the family. She has been sponsored by an undergraduate Shi Lei who has just graduated and found a job in Hang Zhou, I heard. Kun Qian is a 8th grader born in 1998. He lives with his grandma, parents, and an older brother in college (2nd year). His mother has recently recovered from liver disease but now has heart problem. His father does odd jobs to support the family. He is in top three in his class. Miaomiao Ye is a 8th grader born in 1998. She lives with her mother. Her father died of heart disease suddenly in 2011. She is excellent in Chinese and likes running, singing, and reading. She has been sponsored by Corry Gommers in Netherland.